If the wind had a shadow, what would it look like? Nothing like the shadows when photons are interrupted, or those left on radiographs by x-rays that can't quite get through. I can't see x-rays, but I know where they've been. I can't see the wind, but I know when I'm standing in its shadow. I think sometimes the wind's shadow looks like pine needles. When I stand in the swaying shadows of the trees in the forest, I'm standing in the shadow of the wind, too. 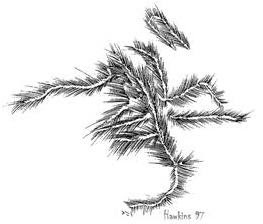 The wind changes the shadows of the pine needles; it makes them dance on the forest floor. In return, the pine needles change the wind. In the forest, the wind makes the sound of a train when it's moving through the pines. As it leaves the forest and turns toward the city, the train's passengers are scented shadows of pine trees dancing in the wind. When it arrives in the city, I think the wind's shadow looks like concrete and steel. The wind never tries to change hard shadows, so they don't know how to dance. The tall buildings ignore the wind. In the city, the wind makes no sound until it's time to turn again toward the forest, and then the wind leaps. How true. One sound that hasn't changed in a few million years is still one of the best.